AccelMotion is located in Liberty Hill, Texas, USA. 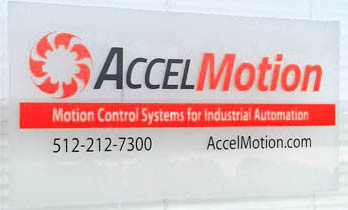 AccelMotion was established from the core technology and experience of its sister company, Advanced Micro Systems (AMS). With over 30 years of motion control design and manufacturing, AMS products have provided reliability and performance in thousands of applications, world wide. Visit our sister site AMS (Advanced Micro Systems) for access to our current range of board-level and chassis-level driver, driver/controller, and integrated motion-control systems.